One of our many Castewallen Gold conifers had some offspring. 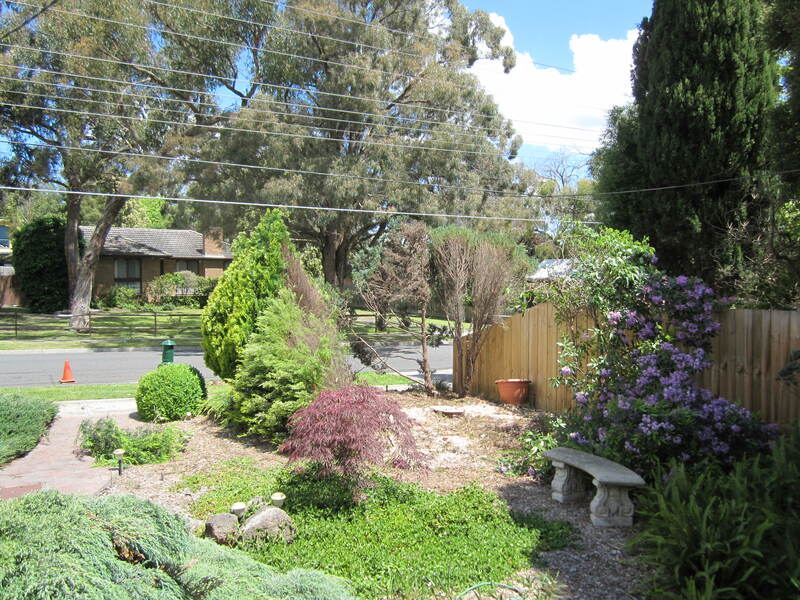 Situated just in front of the rhododendron, a successful cutting I took from the huge purple-flowered one in the front yard, is the rogue conifer. 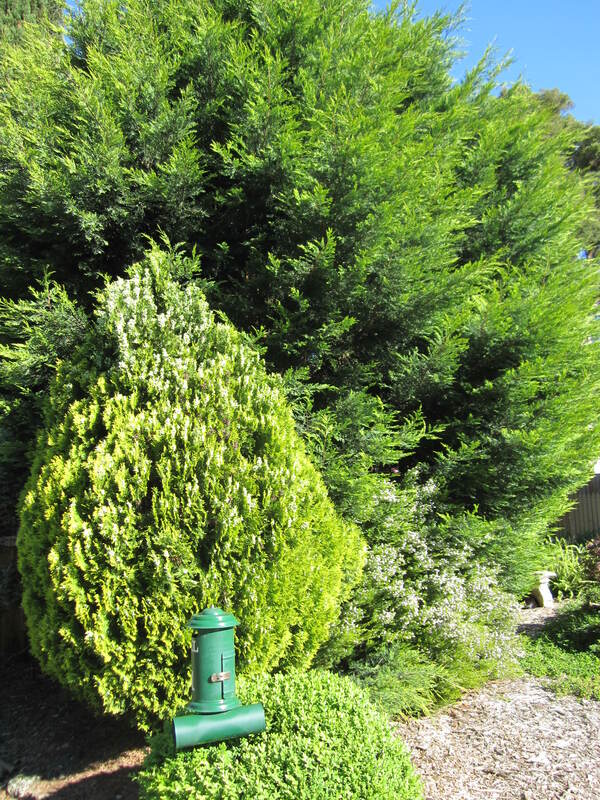 As the conifer has grown larger, I have realised that its position is untenable, as it blocks the pathway and possibly inhibits growth of the rhododendron, necessitating the move. My personal labourer came to the fore again, and did the necessary digging and re-planting of said conifer. Although I work extremely hard in the garden, I appreciate his help in situations such as these, where brawn defeats creativity. Now it has a new home, and hopefully it will continue to grow, but this time I will keep it in check with regular pruning, unlike the previous giants we have had lopped or removed. The path is now clear as is the view looking up towards the top tier. I have found an enjoyment in pruning that equates with an unfulfilled momentary desire to be a hairdresser. But having some fun with haircuts as a lay person and doing it day in and day out would be a different matter. This way I have the fun of creating shapes and managing nature at my will. 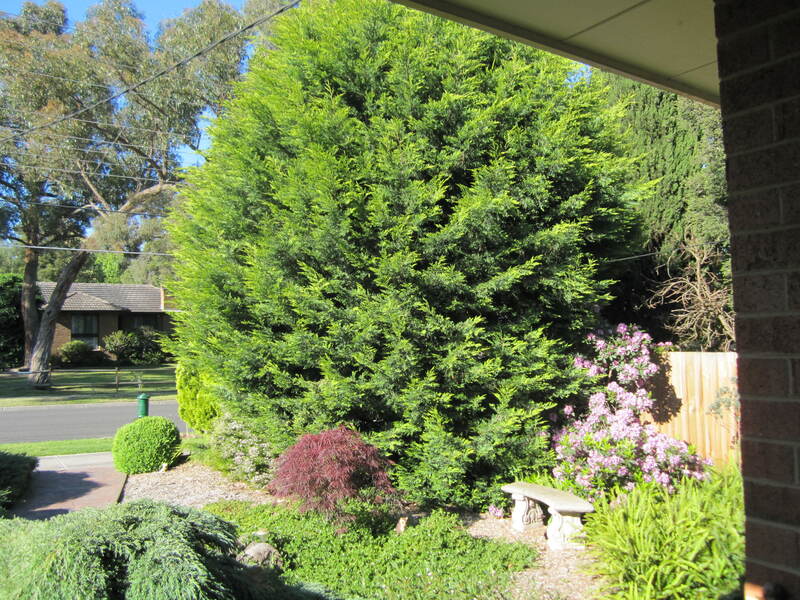 One of the Castewallen Gold conifers that we decided to keep is situated at the front corner of the house. 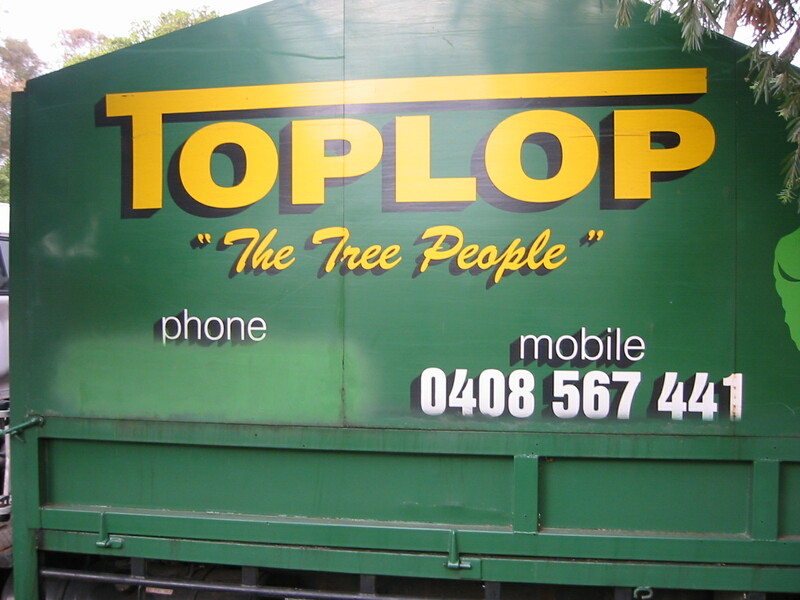 The tree people had lopped the top off, and over a period of years I have pruned and trimmed it into a reasonable shape and size. The ball on a stick is an attractive look, where you can attain some controlled height in a plant. When I planted that little cutting from a neighbour’s property a couple of years ago, I never realised how scurrilous the spreading succulent would be. 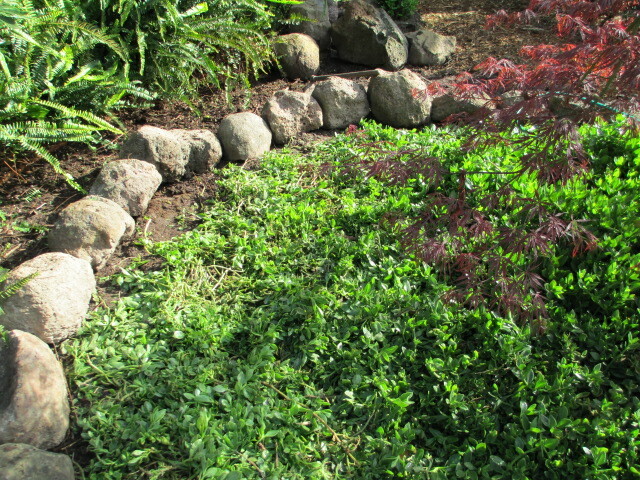 I have now put rocks at the back of the area I wish this succulent groundcover to remain in, carefully digging out any underground roots that I could find. I have no-one to blame but myself; another gardening lesson learned the hard way. 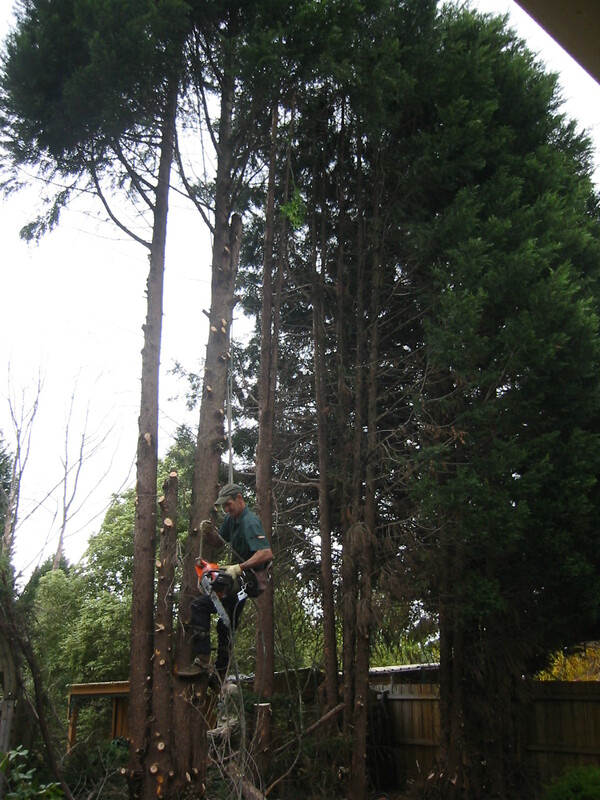 Our Castewallen Gold conifer crisis was probably the most expensive similar lesson learned in our garden. While fast-growing varieties can establish a garden quickly, the downside is that they sometimes take over. 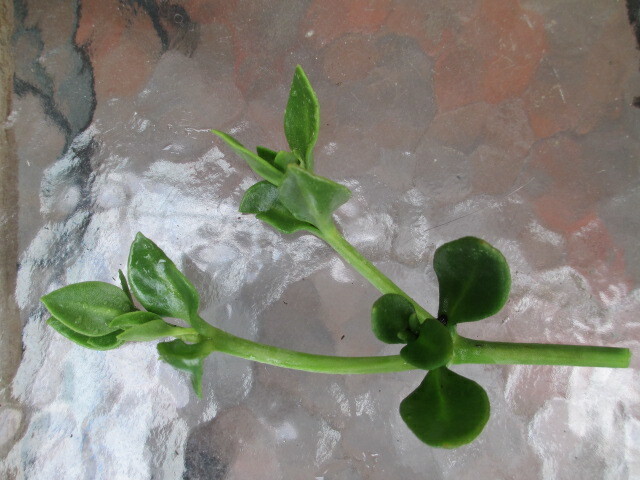 Plants with a slow-growing nature take longer to fill up an area; the good thing about this is they are not usually as invasive as faster-growing plants. Further to this, I am intending to minimise this plant while putting slower-growing plants next to the path, to avoid constant cutting back. 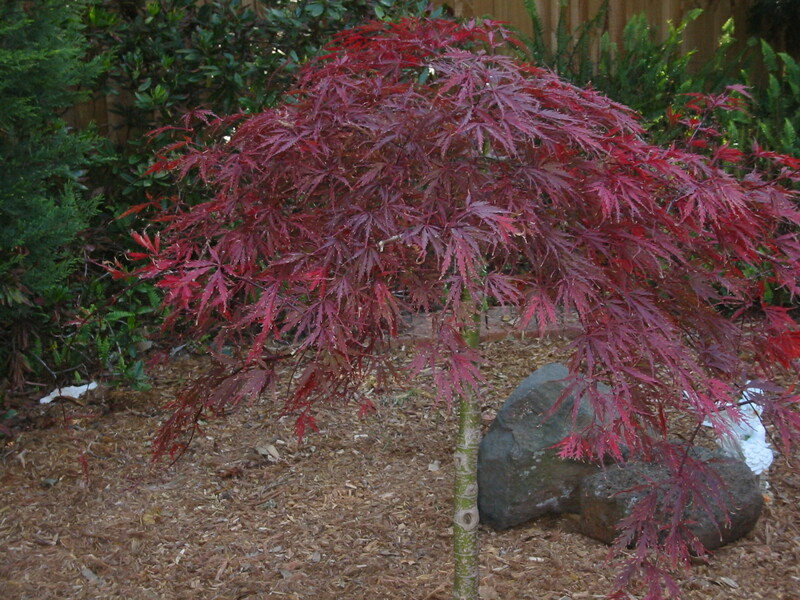 It’s amazing how hard you have to work to create a low-maintenance garden. Little did I know how much this little escapade would cost when I started getting quotes. The irony of it is one of the reasons I wanted to do it was so that I can save money by growing my own vegetables! 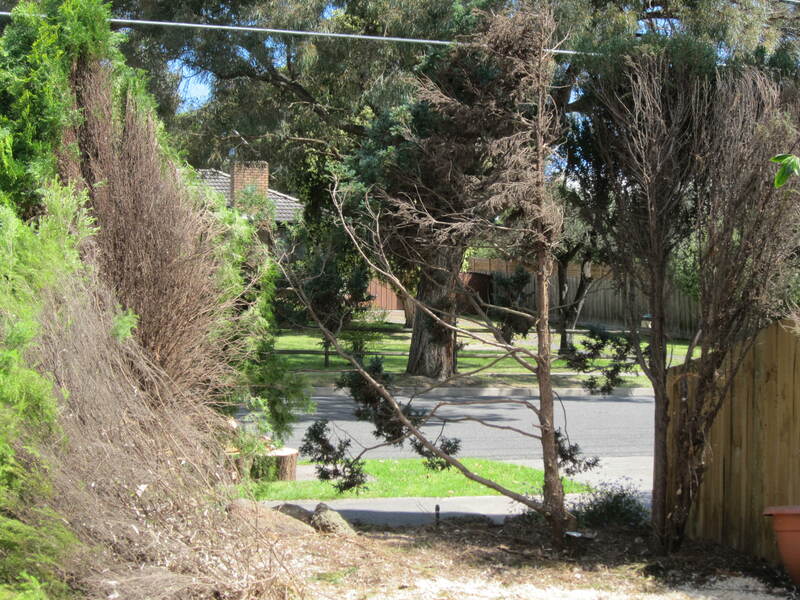 How many years will it take to re-coup the cost of this severe pruning? Don’t ask. 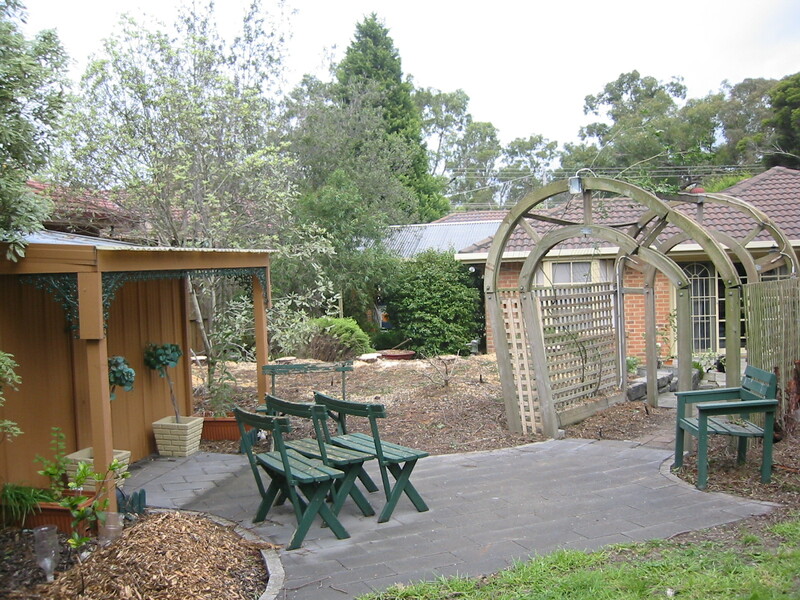 Anyway, it needed to be done regardless of the vegie growing scheme, to allow more sunshine into our garden. The guys from Tree Care Services arrived around 7:30 a.m. for a full day’s work, and work they did in a good, streamlined fashion showing good teamwork and camaraderie, tackling the conifers down the western side first. Firstly they worked on a Castewallen Gold, situated behind the barbecue. 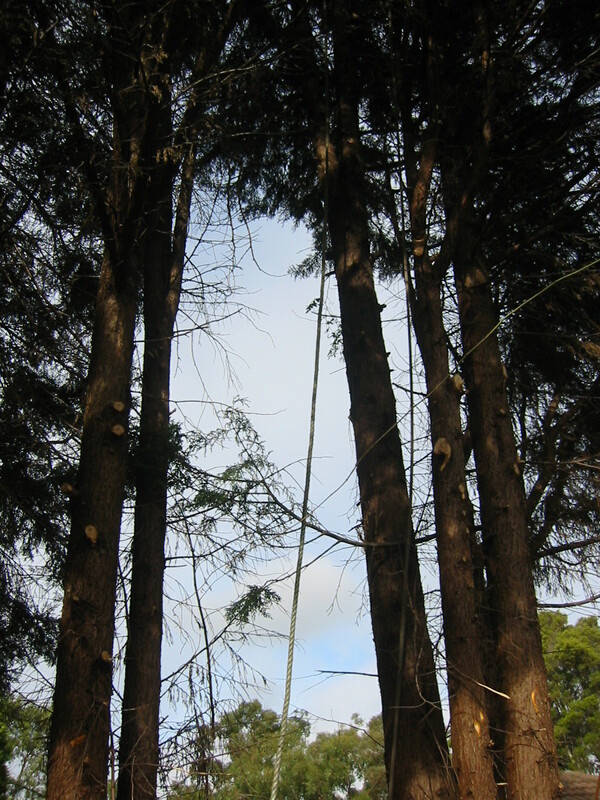 Then they partly worked on the next conifer, a Naylors Blue, allowing footholds and the other trunk to attach ropes to control where the branches would fall. There’s definitely a scientific art to the whole procedure. I like to look after any tradesmen who visit with a cuppa and some home baking, which I brought out for morning tea, still warm from the oven. The western side of conifers now stands level with the top of the television antenna on our roof, a vast change from the almost 20 metres some of them had attained! Stay tuned for the next exciting eastern side of the project in my next post! 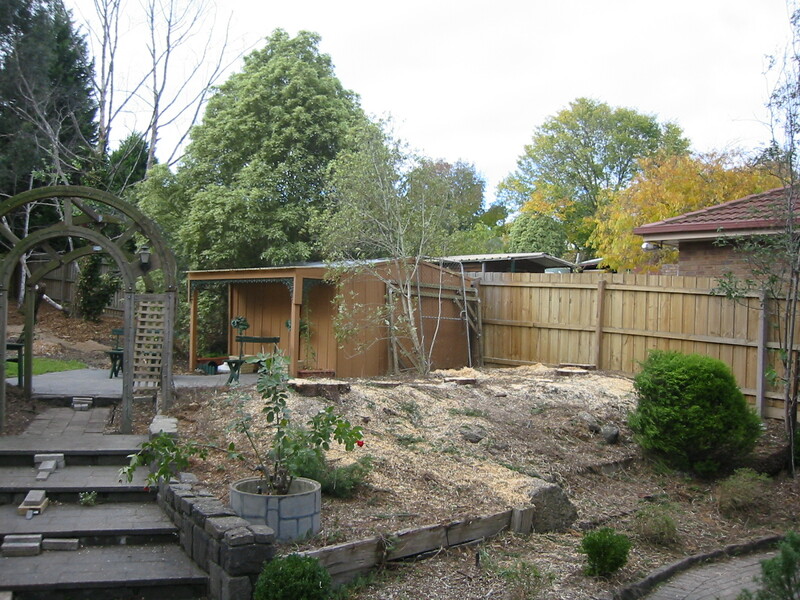 When we first bought the garden shed, we placed it way back in the far corner of the yard. Later we realised it would be more practical to have it in an accessible position, and also on a concrete base. 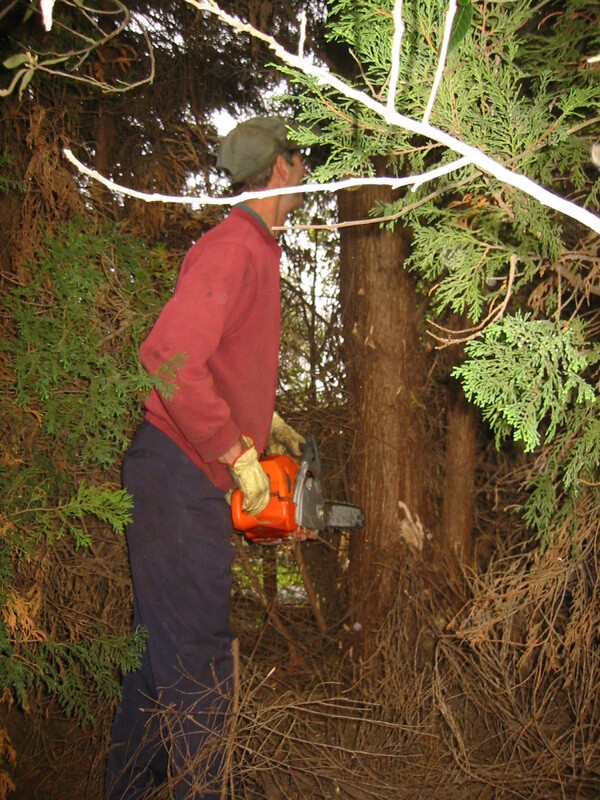 Thus we prepared a spot beyond the conifers which divided the bottom and middle tiers. 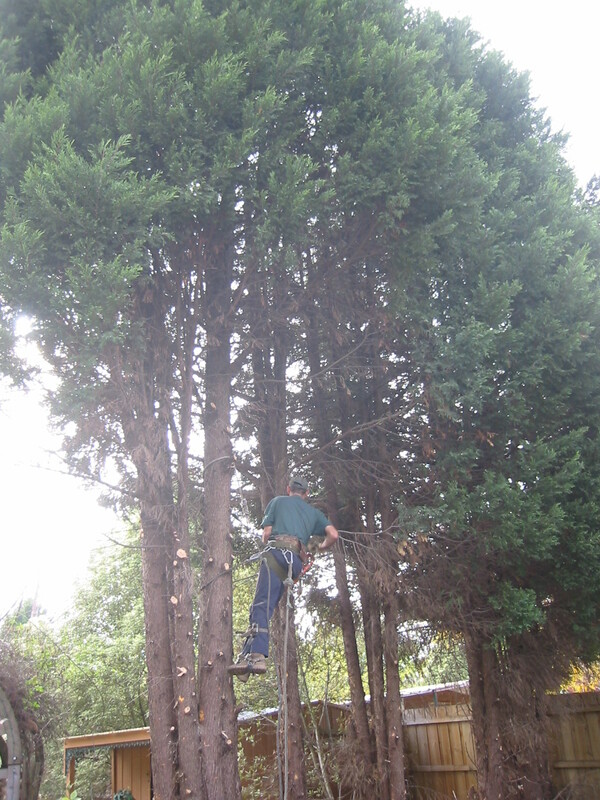 You may notice those lovely Castewallen Gold conifers which ended up being removed. This was their optimum size, back in the early 90’s, but unfortunately we couldn’t freeze their growth. The shed was duly moved onto its new bed of concrete, and then we planted some variegated pittosporum and a couple of groundcovers in the rather neglected garden bed next to it. With the demise of the six Castewallen Gold conifers between the middle and lower tier of the back garden, another blank canvas presented itself. 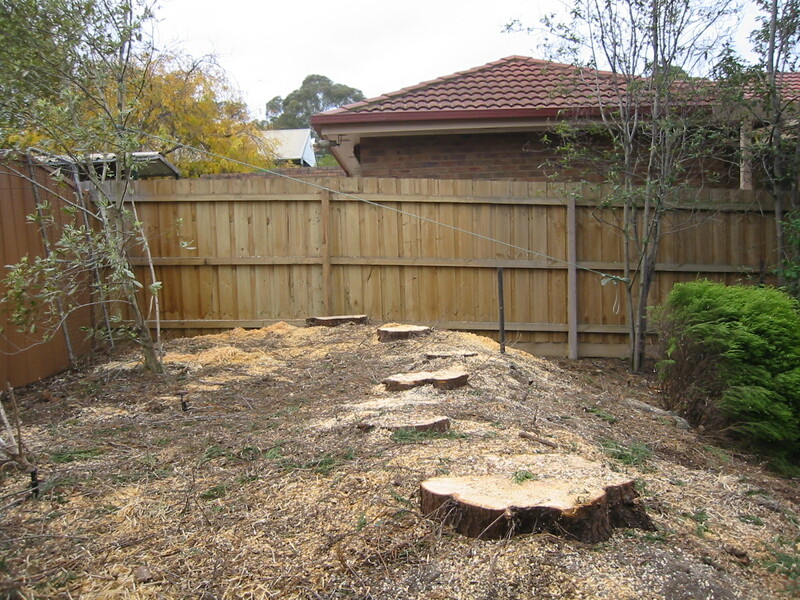 We had left the stumps in place, due to the extreme cost of getting them removed. I decided pots and ornaments could rest on these bases, and eventually the garden would grow and disguise them anyway. 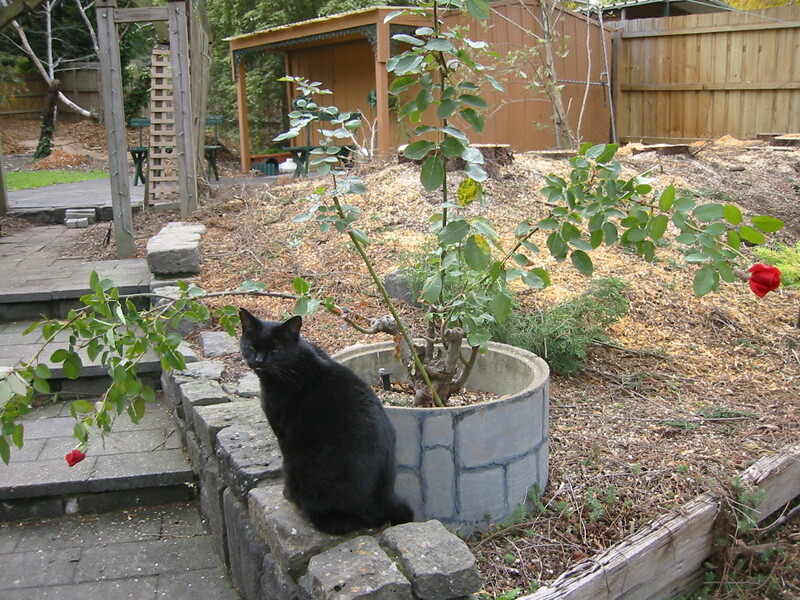 The privacy that had been created between the tiers was gone, but that was a small trade-off to gain some good garden potential and a lot more light. A couple of purchases of a golden diosma and a greenstead magnificent (whose fated story takes place on day 92/366: greenstead not so magnificent), some small english box plants, a few other plants plus some cuttings, filled the garden fairly quickly. 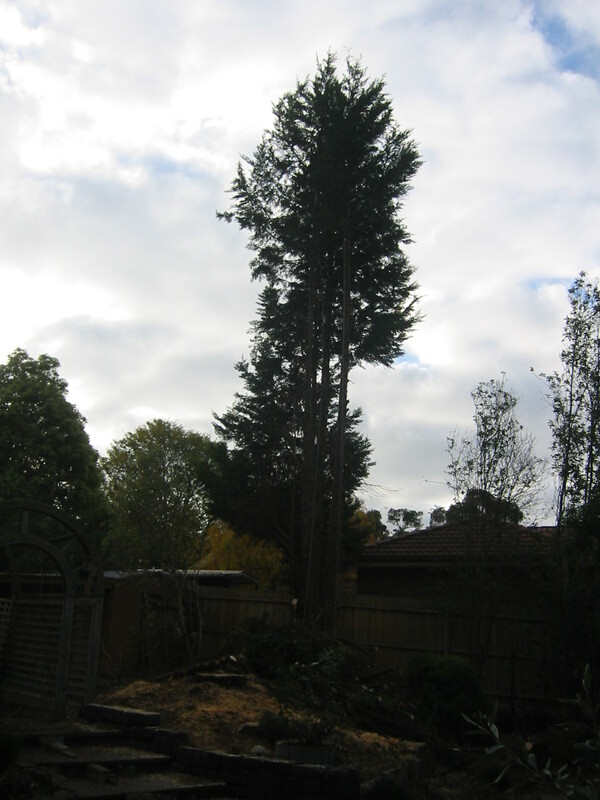 The beautiful row of Castewallen Gold conifers between the bottom and middle tiers of the back yard finally reached such unwieldy proportions that we had to call in Toplop to remove them. Who would have believed that those little plants could grow that large? See day 61/366: wish they could stay that size. They were also featured in the foreground of day 111/366: it’s a frameup. 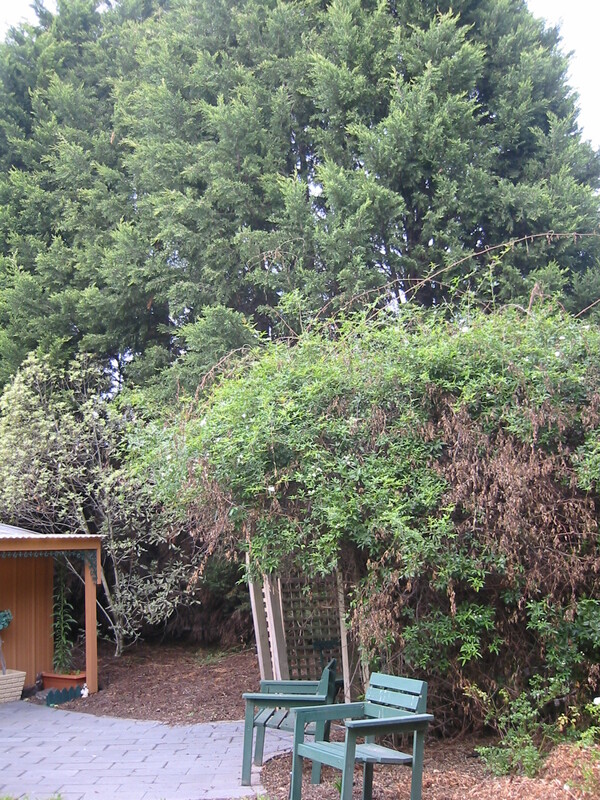 From the middle tier, the shed and rose arbour can be seen to be miniature-sized in relation to the huge conifers. The bases needed to be cleared to provide a working area. Going up the trunk, it looks like he is abseiling. He is in fact, working. He almost disappeared into the heavens. Light began to shine through the spaces created. 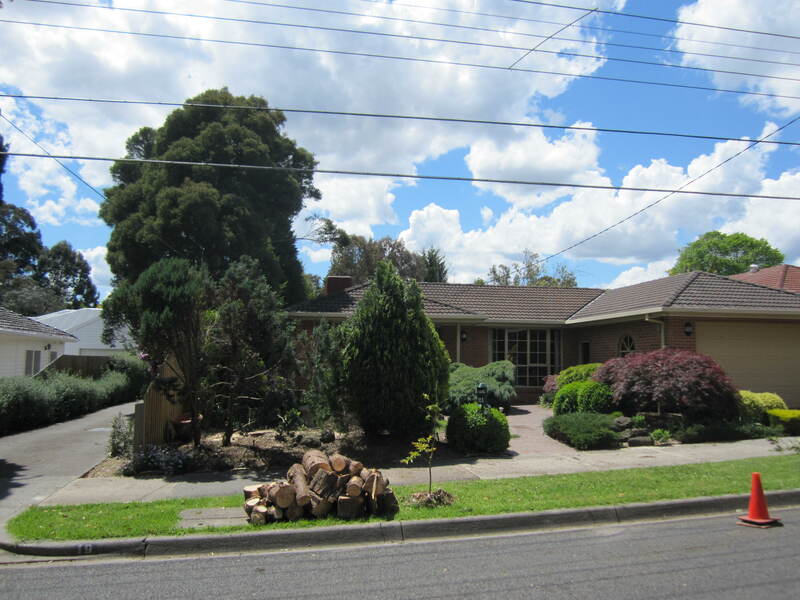 One lonely conifer on the eastern side of the block gets ready to meet its doom. At the end of these proceedings, my cat Shadow looked around, bewildered.